Jelly belly jelly beans in assorted flavors. 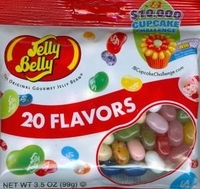 This is an assorted bag of the top 20 flavors of jelly belly jelly beans. You get all your favorites, eat them one at a time or combine then to make you own special favorite. Flavors included in this mix is Blueberry, Bubble Gum, Buttered Popcorn, Coconut, Cotton Candy, Green Apple, Juicy Pear, Sunkist Lemon, Lemon Lime, Licorice, Orange Sherbet, Peach, Pina Colada, Sizzling Cinnamon, Strawberry Cheesecake, Sunkist Tangerine, Toasted Marshmallow, Tutti-Fruitti, Very Cherry and Watermelon.